Guru Veena Agarwal is an outstanding bharatnatyam exponent. She is trained in bharatnatyam from very young age in Rourkela (Orissa) from a renowned dancer Guru Jayshree Gopalan, Cousin of actress honourable Hema Malini. She has obtained a postgraduate degree in bharatnatyam from Prayag Sangeet Samiti, Allahabad. She has contributed immensely in popularizing bharatnatyam with her mesmerizing performances. She has a commanding and hypnotic stage presence. She continues to perform, research, choreograph, expanding her repertoire and train young aspirants. She has choreographed many dance dramas based on mythological stories. In the famous dance dramas like Krishna Leela, Shiv Vivah, Mahishasur Mardini, Ramayana,Mahabharata and Ardha Narishwar. She is based in Dehradun and runs her own institution Kanak Kala Kendra, since 1987, Affiliated to Pracheen Kala Kendra Chandigarh. She is the recipient of several national and state awards such as Gaurav Bharti,Uttarakhand Gaurav,Sarvashreshtha Kalakara etc. She has been recognized as a great artist by critic in publications being graded as Doordarshan artist and interviews with national news channels and other networks. Bharatanatyam, sometimes referred to as Bharathanatiyam or Sadir, is a major genre of Indian classical dance that originated in Tamil Nadu. Traditionally, Bharatanatyam has been a solo dance that was performed exclusively by women, and expressed Hindu religious themes and spiritual ideas, particularly of Shaivism, but also of Vaishnavism and Shaktism. 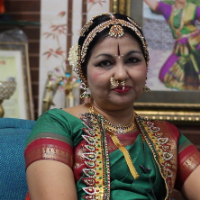 "I am a Bharatnatyam Guru and a Performer. I have been learning Bharatnatyam since I was 4 years old and I have performed in various areas in India and Bangkok as well. I did a post graduate degree in Bharatnatyam from Prayag Sangeet Samiti, Allahabad. I am teaching at my institute in Kanak Kala Kendra in Rajendra Nagar where people of all ages come to learn Bharatnatyam."